Architects and industry professionals will gather at Chelsea Piers in New York City on Oct. 22 for their annual black tie event supporting the American Institute of Architects New York Chapter (AIANY). Each year at the ball, honorees select a school of architecture from which one student will receive a scholarship. This year, honoree and Syracuse School of Architecture alumnus David Rockwell ’79 of the award-winning Rockwell Group, designated his alma mater for a $1,000 scholarship in his name. 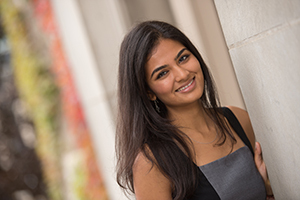 Architecture student Tanvi Sanghvi has been selected by the school to receive this scholarship in Rockwell’s name. Sanghvi will attend the gala event and receive her award during the festivities. Dean Michael A. Speaks will accompany her. Sanghvi is from Butler, N.J., where she graduated from Kinnelon High School in June 2011. She will receive her bachelor of architecture degree in December 2015. In spring 2014, Sanghvi studied in the Florence Program and received a Piranesi Award. She is a member of the National Society of Collegiate Scholars. During the course of her studies, she received valuable professional experience as an intern at two New Jersey firms: Posen Architects LLC (West Orange, N.J.) during summer 2013 and 2014; and GSM Architects (Kinnelon, N.J.) in summer 2012. She received a Crown Award for Capstone Research through the Renée Crown Honors Program, allowing her to travel to Jaipur, India, as part of her thesis research. In December, Sanghvi will present her thesis, “Sponge Logics,” challenging the distinction between mass and envelope in contemporary architecture—based on the thinking of architect and theorist Greg Lynn. Her thesis proposes a sponge as a typological case study to identify the potential of a “porous building” that can contribute to the enrichment of an already multivalent and densely packed urban environment. After graduation, Sanghvi says, “I would like to work in an integrated services firm because I am interested in how design projects are realized. For the next few years, I want to focus on getting licensed and potentially even explore the option of working in another country.” To learn more about Sanghvi’s work, review a portfolio of her work here.